Explanation: This aurora was a bit of a surprise. 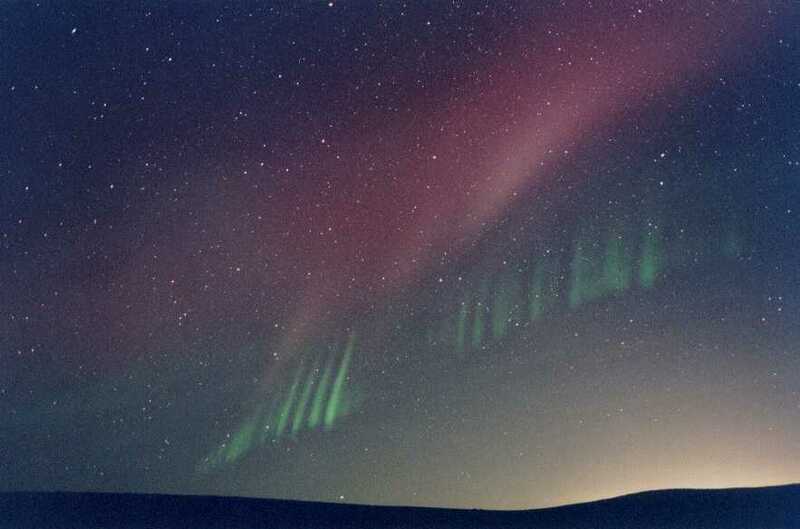 For starters, on this day in 2002, no intense auroral activity was expected at all. Possibly more surprising, however, the aurora appeared to show an usual structure of green rays from some locations. In this view, captured from North Dakota, USA, a picket fence of green rays stretches toward the horizon. Mirroring the green rays is a red band, somewhat rare in its own right. Lights from the cities of Bismarck and Mandan are visible near the horizon. Note: A German language mirror of APOD is now available. Thanks for sharing this really beautiful photo of a phenomenal auroral display. Absolutely incredible! You know, since scientists recently discovered the aurora borealis is created by charged particles from the Sun impacting the Earth's upper atmospheric magnetic fields and then start flowing like electric currents, I can't help but wonder if we can tap into that energy and beam it down to the ground for conversion into useful electricity. Something like what David Kagan wrote about in his SF book Sunstroke, in which satellites beam solar energy in space to earth in the form of microwaves that are then converted into electricity. When it comes to various mechanisms to transmit energy from to space to terrestrial receiving stations, I've always thought that even when the technology matures to the point that it becomes feasible that it will still not be implemented because of political reasons. Could you just imagine what, for example, Russia's response would be if the US said that they want to put a machine in orbit that is capable transmitting huge amounts of concentrated energy at Earth bound targets?